Check our calendar for your desired dates. There’s no rules. Start any day and book us as long as you’d like. We’re flexible. Well only as long as you book your trip long enough to truly experience all that the Virgin Islands have to offer. But again, it’s your cruise. We’re here for you. Contact us at info@cruisenautic.com for the best April rates. Free sleep aboard the night before your 2019 summer charter week. Contact us at info@cruisenautic.com to get started on your booking. Below you will find our calendar with available dates as well as all the details on our options and rates. Contact us at info@cruisenautic.com with your requested dates and we can get started on your booking. Have questions? Include them in your email and we are happy to share the inside skinny. Follow us on Facebook and Instagram for all the latest updates and deals. Green squares denote available dates. Sorry folks the red squares are already booked. CruiseNautic offers three pricing tiers with many options to customize your reservation to the perfect set up for your vacation. Did you know the price of a bareboat charter is just that. Most charter companies have hidden fees on items such as rental fees for water gear, insurance and not to mention the requirement of stocking up your boat. CruiseNautic has you covered with no hidden fees. With a variety of water gear to keep the fun going and a fully stocked boat, you can sit back and let the relaxation begin. Custom and last minute bookings are available as schedule allows. Included are opportunities such as pairing up bookings into a group, offering you greater saving opportunities should you be a small party or single occupancy. Pricing varies pending availability. Accommodations vary according to availability. 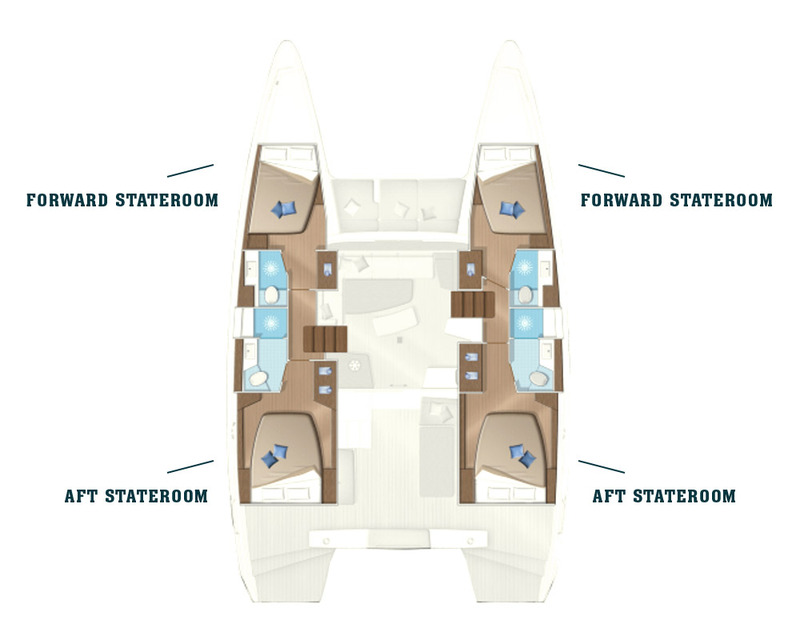 Base rate includes Forward Private Queen Stateroom. Private Yacht & Service of the crew (captain, hostess/cook). Insurance for the yacht and the passengers (civil liability). Accommodation in 3 private air conditioned double cabins with ensuite bathroom. Bedding, towels and beach towels. Consumables for the yacht (diesel, fuel and water). Water sports on board: snorkeling gear, 2 stand-up paddle boards, Tandem kayak, floaties, towable inflatable, fishing gear and tackles. Breakfast each day, four lunches and four dinners with full bar per week. All meals served aboard (breakfast, lunch and dinner daily). Includes full bar and wine served nightly with dinner. Minimum child age is water safe and ability to swim is recommended. A personal, appropriately sized class III life vest is required. The rates do not include. Cancellation Insurance and private insurance. Extra drinks, fine wines, champagne & spirits, special meals. Harbour and mooring fees, clearance, cruising taxes, national park and customs fees. Transfer airport – base – airport. Tip – Industry standard is 20% gratuity. *And more generally all that is not specified as included. One ways / Relocation in Caribbean. St. Thomas pick up / drop off.